Wisely overlooked, "Trixie, the Schizophrenic Girl", is a graphic novel, and a collection of stories that was started in 2006. "Trixie" was a downtrodden girl who went through personal turmoil only to thrive as a musical artist who triumphed over social adversity and became a little bit of a cult hero. She used her skill and her art to get revenge on her hometown for trashing her early years, and moved to another country to seek refuge and fame. This book also contains favorites like "The Trees that got mad", "The Folk Singer", and "Hitler wanted to be an Artist". Another personal favorite is "The Boy, the Stones, and the Tree". This book practically wrote itself. Go to my FACEBOOK to see my new artwork for the upcoming show at the Phoenixville Art Center in July during Blobfest 2013!!!! Michael D'Orazio's Books has now gone international, and you can find his work on Amazon websites around the world. 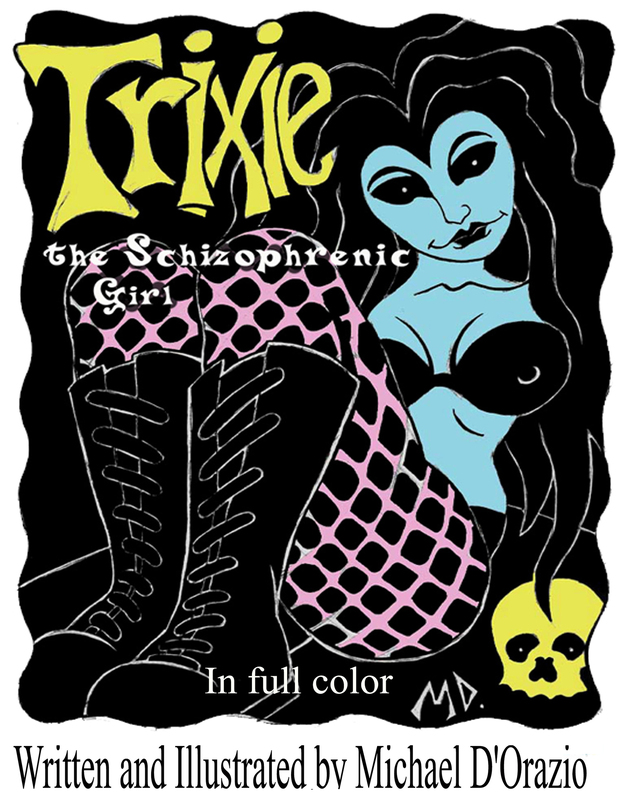 "Trixie, the Schizophrenic Girl[in full color]"
If you don't want to buy anything you can donate to Michael D'Orazios Gallery. Help keep the spirit alive! !